Did you know that over 70% of invoice reporting is still performed in Excel? Just think – all of the efforts to move your invoicing data to a digital state and you could have stuck with mailing out CD roms. But seriously, why are your enterprise customers continuing to rely on an offline, seemingly archaic application to perform their reporting? Simply stated, because they’re performing manual tasks that Excel makes possible – not efficient – but possible. Although a lot of companies have made the shift to online invoicing, there’s often a disconnect between what’s provided and what customers actually need to perform their monthly review and payment processes. And for those who have made the transition to a flexible digital model, combating the “It’s what I’m used to” state of mind can be a challenge. 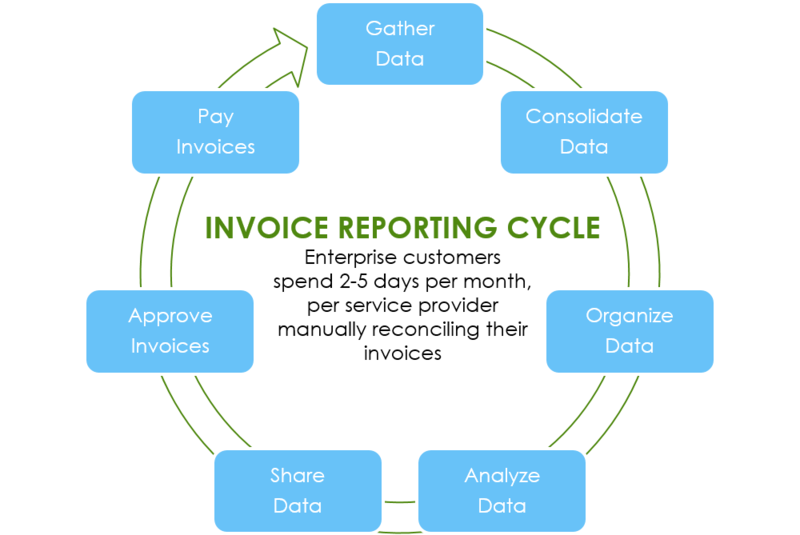 So what’s the outcome of an invoice reporting cycle that is ridden with manual processes, i.e. manual data consolidation, manual reporting, manual delivery, manual allocation? For your customers, it’s valuable resources spending countless hours each month to ‘make the numbers work.’ Look at the cycle below – and then think of a customer with thousands of wireless and hundreds of wireline accounts. Depending on the current state of your invoicing portal, they’re having to pull data from varying systems with varying outputs and then transposing it into a comparable format. And this is where the old faithful Excel comes into play. People know how to use it, people know how to view it – making it the obvious default. May be shocking to hear but some of your largest customers are manually transferring usage and charge fees from their paper invoices into a spreadsheet. And then comes the review and approval portion of the cycle, which can vary from scanned documents, to emails, to physically getting signature approvals from all required stakeholders. Do they think it’s a good system? Nope. But until they have something better in place (and are convinced so), this tried and true process will continue to absorb days of productivity every month. Unless the onus shifts to you – as a ‘custom’ request. Custom invoicing, custom reports, custom delivery – continuing and spreading the reach of the manual cycle. Your billing specialists are spending upwards of 50% of their time just tracking down the data required to deliver against the pile of custom requests. And translating customer requirements into a repeatable report is no easy task, which is why the process can take weeks or even months to get to a point of approval…that is until the customer wants another tweak. When you evaluate productivity across the invoicing and payment cycle, it’s the manual reporting that not only slows things down, but results in significant costs for both you and your customer. One billing specialist estimated that the average ‘custom’ report was costing their company thousands of dollars, based on the people, systems, and time involved to produce and maintain. Multiply that times hundreds of enterprise customers and the issue (and opportunity) is clear. The not so obvious cost of the manual cycle? The impact to customer engagement. Customers want the ability to self-serve but many have become dependent on the outputs of your teams. They want the ability to automate the process but have become accustomed to their offline reporting in Excel. They want to support you in your shift to digital but need convincing of the transition. They know there’s more value in the data you’re providing but their time is consumed with manual validation, leaving little opportunity for proactive analysis. The breaking of the manual cycle requires a technology shift but just as important, a behavioral shift –for both your customers and your internal teams. Think through the stages below. Are you providing the data (all of it) and the tools required to automate the process?